When you were a kid, what did you want to be when you grew up? Like most kids, you were probably asked that by aunts and uncles and parents and guidance counselors until you finally came up with a fast answer. What was it? What happened? Did you live up to the dream adult you that the little you created? As a boy, I always wanted to be a pilot. The pilot thing was kind of funny, since I’ve always been really afraid of heights. But that was it for me. I built model airplanes and looked skyward as the aluminum birds flew over my house and dreamed of someday being the ace of the base. I wish I had half of the money I spent as a youngster flying an arcade game called F15 Strike Eagle. When I was 10 years-old, my parents bought me a flight in a small sea plane for a quick sight-seeing tour of northern Michigan. Years later, my high school physics teacher, who was a pilot, flew me in a four-seat Piper to the same area in Michigan to meet up with my parents for a vacation. I was hooked. My flying dreams were stored away for more “practical” college courses and jobs. Many years later, my wife bought me a discovery flight at a local airport for my 28th birthday. We flew from Evansville, Indiana’s airport with me in the left-seat of a Cessna 172. I was finally at the controls and “piloting.” The young flight instructor allowed me to manipulate the flight controls and my young, very scared bride was in the rear seat praying. She reminded the flight instructor several times during the flight that I really had no idea what I was doing and to not trust me to fly. I remember gracefully soaring over the Ohio River that sunny afternoon in June. Still hooked. But not a pilot. Fortieth birthdays have a way of resetting some priorities and dreams. If I was ever going to become a pilot, now was the time. My best friend surprised me during a trip to Daytona Beach, Florida. He had arranged for me to meet a friend of a friend who was a flight instructor and who owed a show quality T-6 airplane. 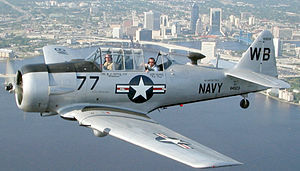 It was a World War II aircraft, painted in U.S. Navy colors. My first logged 1/2 hour of flight instruction was in that amazing airplane. I later found out that my flight instructor, who so generously shared his time and airplane with me, was formerly one of Elvis Presley’s pilots. It was a unforgetable experience and is now a favorite story to tell! A year later, I was a licensed pilot. I guess I finally grew up. Mission accomplished. My dream transformed into a reality and I now live my dream when time and money allow. I am still hooked. My smile never fades when I’m flying. 1) Some dreams stay with you always. If they don’t go away; it’s because they want to be real. 2) Don’t be afraid to share your dreams, even if they seem crazy to some. You never know who might decide to help you make your dream come true. 3) If you really want to experience something that you’ve never done before, you’ve got to do it to experience it. 4) Sometimes it’s ok to be really afraid and to do something anyway. 5) Don’t wait too long to chase your dream. 6) If you did wait too long to chase your dream, run a little faster to catch up with it. 7) Figuring out “How” to live your dream is more fun than “Why.” It may not be easy, but it will be worth it! 8) Living your dreams leads you to living a life that is fired up! 9) People may laugh at you. People may try to discourage you. People may say you are crazy for chasing your dream. They are probably just jealous or too afraid to chase their own dreams. Don’t pay too much attention to them. 10) Build your plan and take action. That’s how dreams are made. Who do you want to be when you grow up? Is it time to grab some sky of your own? What dream of yours won’t leave you alone? What’s the first step you can take today to get you inches closer to making it a reality? Are you willing to be courageous enough to take the first step? Catch a dream today! If you too are a dream catcher, please share your story by posting a comment. 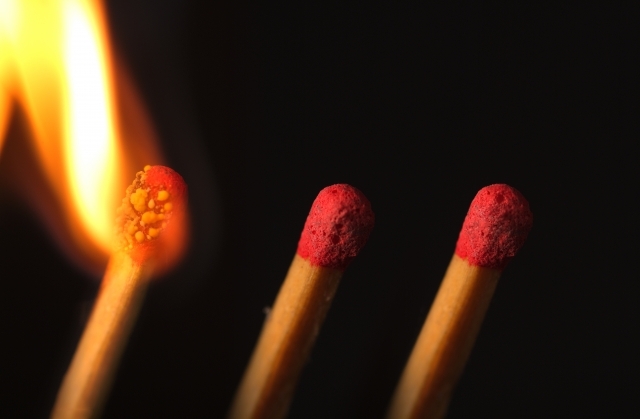 3 Steps to Fire Up Your Life! How can you live a life that is more passionate, fulfilling, meaningful, on-purpose and satisfying? 1) Find ways that you can use your unique, God-given, strengths, talents, gifts and resources to serve others. 2) Serve others passionately, humbly and as anonymously as possible. 3) Repeat steps one and two daily. Tom Rath and the wonderful folks at The Gallup Organization created “StrengthsFinder 2.0” to help you to learn about your natural, personal strengths. Marcus Buckingham has written numerous books on how to put your strengths to work. I wrote “Life Matches: Fire Up Your Life!” to help you to make living a strengths-based life a habit. Download my how to find your strengths exercises for free here: Life Matches: Fire Up Your Life! Exercises. 1) Fuel=Passions, strengths, talents, gifts, knowledge, skills, and personal experiences. 3) Ignition souce=Other people, situations, circumstances and I believe, God. You were uniquely designed for a purpose. Your life’s quest is to seek to discover and to serve your purpose. Your purpose will involve serving others in ways that only you can serve them. Your service to your purpose may end up only being a percentage of your time, but it will be your most satisfying use of your time. Living on-purpose is the reason to live. My life motto is, “Learn it. Live it. Share the spark!” I believe that my purpose for being alive is to first learn new things. Then I live with them to personally prove that the new learnings are true and helpful. Finally, I get to enjoy the satisfaction of sharing what I have learned and how it has personally benefitted me in my life’s journey to hopefully help others in their journeys. I live to be an ignition source or as I like to think of it, a “sparker” of other people so that they can live their lives more “Fired Up!” Each time I can share a spark with someone it fuels me up to invest more time in sparking more people which helps keep my life matches burning brightly! Sparking others is my passion and is now my habit. I was not always a sparker. I had to learn and do the three steps above. Unfortunately, one tends to lose what one does not use. Fire up or fizzle out. You get to choose. I choose to live Fired Up! Hopefully, by writing this, I have shared a spark with you. Please let me know if this helps you to serve your life’s purpose and to Fire Up Your Life! Then you will be sharing your spark with me. PS: I give all money I receive from the sale of the book “Life Matches: Fire Up Your Life!” to CHADD, the national non-profit organization that supports people with Attention Deficit Hyperactivity Disorder (AD/HD). Learn more about CHADD at http://chadd.org. 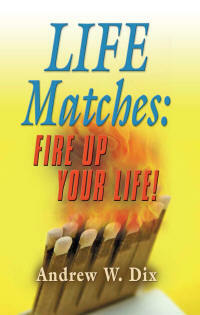 You can buy “Life Matches: Fire Up Your Life!” at http://www.booklocker.com/books/4765.html.